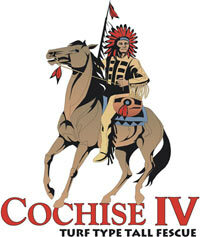 Cochise IV is the latest in the line of our top rated Turf Type Tall Fescues. 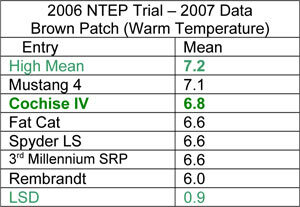 Shown as RKCL in the 2006 NTEP, Cochise IV is #1 in the Quality Ratings (Schedule A), #1 in Leaf Texture and continually on the front page throughout the trial. Cochise IV is a selection out of Rutgers University based on its dark green color, dense turf, fine leaf blade and excellent disease resistance making it your #1 choice for a top all around Turf Type Tall Fescue. With excellent NTEP scores for Overall Turf Quality, Cochise IV is the top choice for Sod farms, Athletic fields, Park and Home Lawns. For salinity trial information click here.